Malware Logs can sometimes take a lot of time to research and interpret. Please be patient while I try to assist with your problem. If at any time you do not understand what is required, please ask for further explanation. Please note that there is no "Quick Fix" to modern malware infections and we may need to use several different approaches to get your system clean. Read every reply you receive carefully and thoroughly before carrying out the instructions. You may also find it helpful to print out the instructions you receive, as in some instances you may have to disconnect your computer from the Internet. PLEASE NOTE: If you do not reply after 3 days your thread will be closed. I can see evidence of a serious malware infection on this machine. If you use this machine for any financial transactions please find an uninfected system and change all of your passwords as soon as you can. It would also be wise to back up your important data at this point. Please download DeFogger to your desktop. Click on DeFogger to run the tool. The application window will appear. Click the Disable button to disable your CD Emulation drivers. A 'Finished!' message will appear. IMPORTANT! If you receive an error message while running DeFogger, please post the log defogger_disable which will appear on your desktop. Do not re-enable these drivers until otherwise instructed. Double click the aswMBR.exe to run it. When asked if you want to download Avast's virus definitions please select Yes. Click the "Scan" button to start scan. On completion of the scan click save log, save it to your desktop and post in your next reply. Download GMER Rootkit Scanner from here or here. Extract the contents of the zipped file to desktop. Double click GMER.exe. If asked to allow gmer.sys driver to load, please consent. If it gives you a warning about rootkit activity and asks if you want to run scan...click on NO. Save it where you can easily find it, such as your desktop, and post it in your reply. Please post the aswMBR log and the GMER log in your next reply. If you encounter any problems with the scans come back and let me know. Would you like to help others? Join the Classroom and learn how. Hello, first of all THANK YOU so much for helping me. Sorry its taken so long to respond, i'm having a little trouble. I probably messed this up but i will give you the "play by play to the best of my recollection. i downloaded deFogger and ran it following all the instructions. i think it did crash and i ran it again and it seemed to work, but maybe not: defogger_disable by jpshortstuff (23.02.10.1) Log created at 20:16 on 25/01/2012 (Christopher) Checking for autostart values... HKCU\~\Run values retrieved. HKLM\~\Run values retrieved. HKCU:DAEMON Tools Pro Agent -> Removed Checking for services/drivers... Unable to read sptd.sys SPTD -> Disabled (Service running -> reboot required) -=E.O.F=- then i noticed i should have backed up my files,so it did, it took almost 40 hours! it crashed quite a few times along the way. at one point microsoft sent a message they were shutting down Ping.exe next i downloaded aswMBR.exe it crashed while trying to download Avast. i tried it again and it was scanning for a long time, and Microsoft Security Essentials was finding viruses while it was doing so eventually it crashed... what should i do next? The malware on the machine is trying to prevent our tools from running which is why you are experiencing the frequent crashes. Please download and run GMER as described in my previous post to you. As soon as BIOS is loaded begin tapping the F8 key until the "Advanced Options" menu appears. Use the arrow keys to select the Safe mode menu item. If you run into any problems just come back and let me know. error 0xC000010E: Cannot created a stable subkey under a volatile parent key. i restarted into safe mode and got the same message so i ran it anyway, the things you told me to uncheck were already unchecked it seemed. IMPORTANT - Disable your AntiVirus and AntiSpyware applications, usually via a right click on the System Tray icon. They may otherwise interfere with our tools. If you have difficulty properly disabling your protective programs, refer to this link here . Notes: Do not mouse-click Combofix's window while it is running. That may cause it to stall. Do not "re-run" Combofix. If you have a problem, reply back for further instructions. In IE: Tools Menu -> Internet Options -> Connections Tab -> Lan Settings -> uncheck "use a proxy server" or reconfigure the Proxy server again in case you have set it previously. In Firefox: Tools Menu -> Options... -> Advanced Tab -> Network Tab -> "Settings" under Connection and uncheck the proxyserver, set it to No Proxy. Please post the Combofix log in your next reply. If you encounter any problems with the scan just let me know. It says "There's a newer version of ComboFix available. Would you like to updated ComboFix?" what should i do? okay, i am going to go for it and trust this update. It says "There's a newer version of ComboFix available. Would you like to updated ComboFix?" Did you run Combofix before asking for help at this forum? Allow the update to install - its normal behaviour for the program. So i ran combofix, i don't believe i ever had combofix downloaded to my machine before (i get remote help from my cousin alot so can't be 100% sure) it downloaded the microsoft recovery software and seemed to successfully run until completion i have restarted and shutdown a couple of times and let new software install now i'm having trouble getting online, i'm using my wife's laptop i use google chrome and tried to uncheck the proxy server setting, but it was already unchecked ping.exe is no longer running it seems like we are winning the war here but maybe a couple battles left i was hoping there would be a log i could post, but don't see anything Sooo happy to see some progress!!! thank you!! I'm pretty sure we are not out of the woods just yet. If you are unable to connect to the net using the infected machine you may need to use a removable drive (such as a flash drive/USB memory stick) to transfer tools and logs between machines. Okay. We can use this machine to download and transfer the required tools to the infected machine, and also to post the required logs back here. Click here to download Flash Disinfector and save the file (called Flash_Disinfector.exe) to your desktop. Double click on the Flash_Disinfector.exe icon to run the program and follow any prompts that may appear. The program may ask you to insert your flash drive and/or other removable drives including your mobile phone. Please do so if prompted. 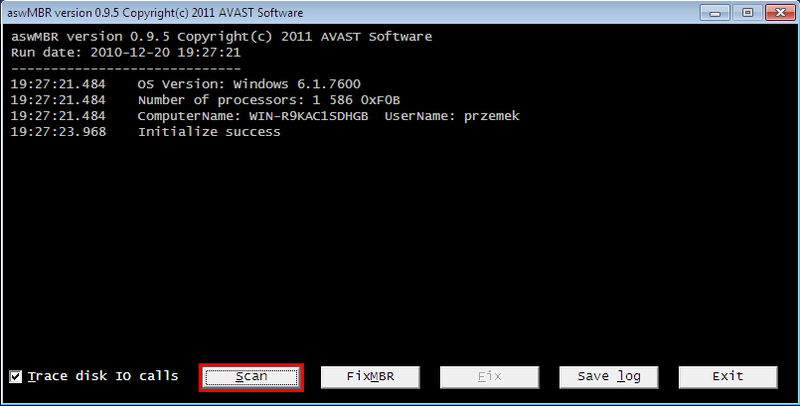 Wait until Flash disinfector has finished scanning and then exit the program. Download Autorun Eater and save it to your desktop. Plug all of your removable storage devices into the machine (USB sticks etc) and run the tool. The Combofix log will determine our next course of action so it is very important that we have it. If you can find the Combofix log, copy it to the flash drive and use the laptop to post it back here. If there is no Combofix log, please scan the infected machine with DDS again and post the logs created in your next reply. Thank you for the logs. There is no need to attach any logs, just post them directly into your replies. Are we talking about Combofix here? If Combofix notifies you that there are updates available please allow them to install. However, please do not download or install any other updates while the machine is still infected as it may cause us problems. I can still see evidence of the main infection (Zero Access Rootkit) on your machine. First, drag the copy of Combofix that is on the desktop of the infected machine to the recycle Bin and then Empty the Bin. Next, using the uninfected laptop download another copy of Combofix to the desktop of the laptop. Once it has been downloaded, I would like you to makwe sure that file extentions are showing so we can rename the downloaded file. Choose to "Show hidden files and folders". Uncheck the "Hide protected operating system files" and the "Hide extensions for known file types" boxes. Close the window with "OK". Close all programs so that you are on your desktop. Click on the "Windows Orb" and select the Control Panel menu option. Double-click on the Folder Options icon. Click on the View tab. Under the "Hidden files and folders" section, select the radio button labeled "Show hidden files and folders". Remove the checkmark from the checkbox labeled "Hide extensions for known file types". Remove the checkmark from the checkbox labeled "Hide protected operating system files". Press the "Apply" button and then the "OK" button. Click on "Show Hidden Files or Folders". More detailed notes plus a video tutorial of this procedure can be found here. Click on the "Windows Orb" (bottom left hand corner of your screen). Click on "Control Panel", and then on "Appearance and Personalization". Under Folder Options, click on "Show hidden files and folders". Remove the checkmark from the checkbox labeled "Hide protected operating system files (Recommended)". For more detail, please see here. Once the file extentions are showing, please rename Combofix.exe to jontom.com. Make sure that it is not renamed to jontom.exe.com (which can sometimes happen). Next, disable all of you security programs then navigate to jontom.com and allow it to run unhindered. If a log is produced (please check your C drive if it does not appear) post it in your next reply. If you are still having problems getting Combofix to complete its run come back and let me know. On the page you'll find a "Choose File" button. In the File Upload window which opens, copy and paste this into the File Name box. Next, click the Open button. Then click the "Scan It" button just below. This will scan the file. Please be patient. If you get a message saying File has already been analyzed: click Reanalyze file now. Once scanned, copy and paste the link to the results page in your next reply. Please download SystemLook by JPShortstuff by clicking here or here and save the file (called SystemLook.exe) to your desktop. Double click SystemLook.exe to run the program. Click the Look button to start the scan. The scan may take a while to complete. Please be patient. When finished, a notepad window will open with the results of the scan. Please post this log in your next reply. Please post the link to the Virus Total results page and the SystemLook log in your next reply.